However, companies such as Roche and Bristol-Myers Squibb, which have just started making a foray into this market and are banking on patent protection for growth, may have to look around and adopt a new strategy. Experts opine multinationals may slow their pace of engagement for some time but India, given its size and growth, cannot be ignored for long. It's a country with a population of over1.2 billion and a pharmaceutical market worth Rs 70,000 crore which is growing at a pace of 12-14 per cent per annum, next only to China which is growing at 19 per cent. 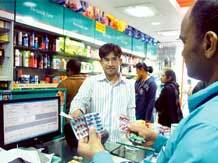 Analysts suggest the Indian pharmaceutical market could touch $29 billion in annual sales by 2016. Besides, the market for oncology, diabetes, cardio-vascular and anti-retroviral drugs, which are the most preferred therapeutic areas of multinationals, are growing significantly here. "The domestic market in India is fairly significant and has also been growing at a fast clip. I think most companies would need to factor India in their plans. Over a period of time, the value of the overall Indian market will assume higher significance," says Utkarsh Palnitkar, partner and national head (life sciences practice), KPMG in India. Some also argue that the issue of patent protection is unlikely to impact investments in India because patented drugs being sold by foreign firms in India are mostly imported. According to senior counsel and director of Lawyers Collective Anand Grover, foreign pharmaceutical companies had not invested on real invention in India for over a decade. Grover, who also represented Cancer Patients Aid Association in the Supreme Court recently against Novartis in the famous Glivec patent protection case, says: "Since 2000, all multinational pharmaceutical companies started disinvesting in India. Most companies no longer produce in India -they import the drugs. So this threat of not investing on R&D in India does not hold". The primary investments undertaken by multinationals in such cases are on marketing and promotion. However, if a company is successful in securing a patent in India, the returns are high with almost the entire market available to the patent holder. The profitability from such drugs also far outweighs the risk involved in litigation. No wonder then, the share of multinationals in total pharmaceutical market has grown steadily to around 30 per cent now from 21 per cent in 2007, industry data shows. When asked whether the recent developments can impact investments by multinationals in India, Palnitkar says: "I think the India opportunity is significant and has many dimensions, such as the market potential, talent pool for research and the like. Perhaps in the medium term there may be a rethink on strategy. However, I do not think it will have a long-term impact." He adds that "companies will have to devise ways and means of engaging with all stakeholders. Being sensitive to pricing in India is an imperative that cannot be ignored. An India-specific strategy will have to emerge in terms of addressing price sensitivity and taking into account volumes." But even that may not be as easy as it appears. Many believe that after the recent hue and cry internationally, following the recent developments on Glivec, invocation of compulsory licence on Nexavar and more recently Merck's allegation against Glenmark of patent infringement of Januvia, prices of medicines in India are being seen as reference pricing by many other nations. "Such a thing may impact multinationals in a bigger way," says Praful Bohra, senior research analyst, Nirmal Bang. According to Bohra, with all developing countries eyeing India for benchmark pricing, multinationals are under the threat that their moves in India may also have to be replicated in other emerging and even in developed economies. Even companies like Novartis have not completely turned away from the India market. Novartis has maintained that it will continue to file for patents and launch new products in India. "Products are launched in any country depending on market profile including unmet medical need. We would continue to consider these factors when launching products, including patented products, in India," Novartis India Vice-chairman and Managing Director Ranjit Shahani says. He adds that the company currently has more than 1100 patent applications for all kinds of inventions pending in India.